NIA CHARLESTOWN NEVIS (January 11, 2018) — Education Officers in the Department of Education on Nevis will have a better understanding of their roles and responsibilities when they conclude a three-day training workshop hosted by the Department of Education from January 10-12, 2018. The workshop “Education Officers Appraisal for Growth and Development Programme,” is facilitated by Dr. Judy Browne, International Training and Development Consultant. 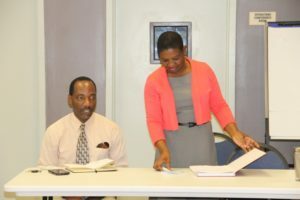 It is designed to prepare the officers for the implementation of the Education Sector Plan 2017-2021 for St. Kitts and Nevis which was launched in December 2017. The event is being held at the Nevis Disaster Management Department (NDMD) conference room. At the opening ceremony on January 10, 2017, Mr. Kevin Barrett, Permanent Secretary in the Ministry of Education on Nevis underscored the importance of training. “Because we are so much involved in change and because we are so much involved in securing the future for our students and future leaders, training is very essential and I am happy that at this point, the early part of 2018…that this training is happening. “This is just the first part because there are other stakeholders that also need that training if we are to effectively roll out this Education Sector Plan… The execution of our education sector plan will depend heavily on what you learn today and what you will impart to the teachers, principals and eventually the students,” he said. Mr. Barrett also brought greetings and well wishes from Hon. Troy Liburd, Junior Minister in the Premier’s Ministry with responsibility for Education, who was unable to attend. Mrs. Palsy Wilkin, Principal Education Officer (PEO) in the Department of Education in her remarks, outlined the significance of the training to the successful implementation of the Education Plan. She stated that the Plan was launched with the theme “Education for all: Embracing change, securing the future” and if they are to work towards that goal, it must be realised as a ministry and department in an effort to achieve the change which must come about in education. “This must come through training…at different levels in our organization. As Education Officers, our roles are extremely important, pivotal for that matter,” she said. Meantime, Dr. Browne registered her gratitude for the invitation to facilitate the workshop. She said it will help to empower staff, give a sense of value and enable the Department of Education to place people where they are most suited for their skills set and interests. The workshop facilitator also indicated that during the workshop, participants would explore the importance of an appraisal system, create a clear definition of the roles and responsibilities of Education Officers and address short-term goals in order to create long-term successes. She said the forum would assist officers to develop from an organisational perspective because of the importance of understanding how the system works from their perspective. In so doing, systems could be developed specific to the department with considerations of the island’s culture.